The first hard top produced for the civilian Jeep was a steel half cab made by Willys-Overland itself, and offered as an option from the beginning of civilian Jeep production. Like the Jeep it was a serious utilitarian instrument designed to complement the variety of farm and industry uses imagined by Willys-Overland. Early sales literature never mentions that the Jeep is really fun to own and drive, yet the customers knew it instinctively. Steve Bovee's family photos of a 1949 rally show us Jeep owners enjoying the camaraderie of Jeep ownership. The Bovee CJ-2A with Willys halfcab is at the "10 o'clock" position in this photo. All hard top manufacturers had to deal with the slight tapering of the Jeep body as it narrowed toward the cowl and windshield frame. Willys dealt with this by ignoring the tapered section and built the top with a rectangular footprint. By doing so the interior gained a few inches of knee space. The original windshield was removed and replaced with a wider one, which fit the cube-like cab. This photo of Don Dill's 1946 2A with original Willys hard top shows the wide windshield and additional knee room. Notice how the front of the cab overhangs the bottom rear of the cowl. The top was meant to be permanent, as there is no windshield hinge bracket on the cowl. 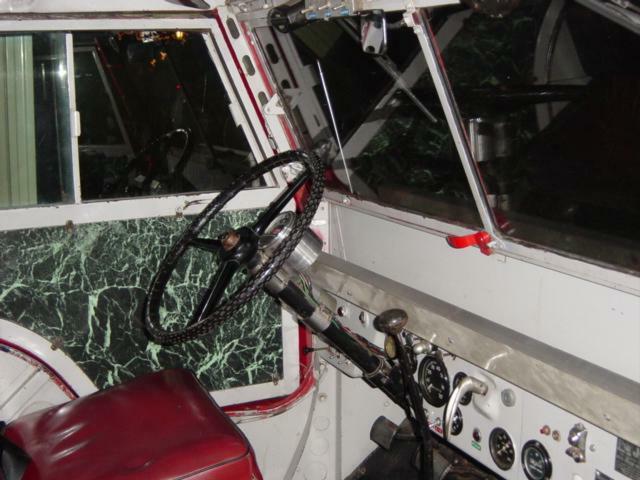 The windshield is hinged at the top and swings outward to ventilate the interior of the cab. By comparison with many other hard tops the doors and door windows are huge, allowing easy access and excellent forward and side vision. See also a rear view photo (30K JPEG) showing both a Willys-Overland cab and a Koenig body extension. A hard panel and a large window has replaced the original canvas rear panel. In 1945 Willys viewed the civilian Jeep as a utilitarian work vehicle. The top has features that support this. The most interesting feature is the rear panel, which opens for greater ventilation and much better rear visibility while using a three-point lift in plowing or other machinery requiring visual access to the rear. Installing a solid functioning rear door on the half cab would have been almost impossible so Willys used a canvas rear panel that rolls up and is stored behind and above the driver's head. A small window allowed a little rear vision while the canvas panel was down. This may be the only metal half cab with this rear-opening feature. It certainly wins first prize for rear visibility. The 1945 factory photo is from Fred Coldwell's Preproduction Civilian Jeeps . The open back allows the driver to position the Jeep for pole setting or pulling. This photo is from a 1953 advertisement but the Jeep pictured is a CJ-2A. Like most steel aftermarket hard tops, the Willys halfcab was much too heavy to casually remove and re-install, so many of these impressive half cabs have been scrapped, making this a rare and very desirable hard top. Wayne and Steve Bovee are pictured in the rear of their father's 1946 CJ-2A in 1953. They still own the 2A with its Willys half cab. Originally there was a canvas rear soft top which could be used to cover the rear cargo compartment and turn the top into a hard/soft full top. One can see what are apparently the connectors on the side of the cab behind the door. See also another photo of the Jeep showing the original canvas rear panel of the half cab. The tiny rear side window reveals this covering as the standard W-O rear canvas unit. The significance of this canvas extension to the Willys steel half cab may be that every unit Willys produced to cover the early civilian Jeep was designed to interchange with any other Willys system. The soft top can be a half cab or full cab, or many variation in between by removing panels, doors, rear panels. Now we learn that the steel half cab can also be a full cab by adding the rear of the full cab standard W-O soft top. A beautiful photo of the Bovees' 2A today. This interior view shows the ventilating windshield. The original Masonite inside door panel had deteriorated and has been replaced. We can sense the remarkable visual field available for the driver, especially important when plowing snow. The Willys-Overland half cab went out of production circa 1948. Perhaps the huge number of aftermarket hard tops coming on the market made it non-competitive. It remains though, one of the most unique and interesting of Jeep hard tops. Continue to Delivery Jeep Bodies or return to the Table of Contents.